All pre-law students know the important quantitative aspects of the law school admissions process: your GPA and LSAT score. Yes, each of these numbers remains critical to how successful you’ll be in your applications. But they don’t paint a complete picture of who you are as an applicant and, more importantly, who you are as a person. The law school personal statement and other short essay questions offer you opportunities to show admissions committees your character and why you’ll be a valuable asset on campus next fall. Although many law schools ask additional essay questions or implement different length requirements for your writing, most will feature one primary, open-ended essay: the almighty law school personal statement. This is the most important piece of writing when you're applying to law school. It is your chance to showcase your writing ability (important in law school and your career beyond), your formative experiences, your values, your personality and anything else important that you want to convey. 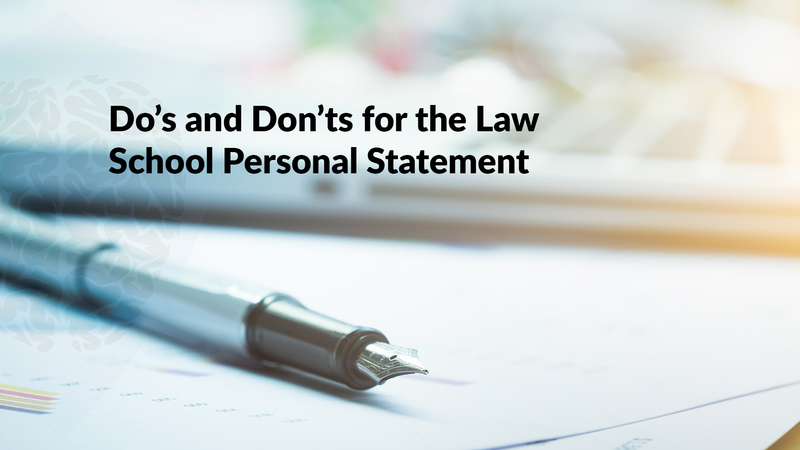 There are many different approaches suitable for putting together your law school personal statement, but you should never stray from one overarching, guiding principle: the personal statement has to be personal. Each year, law schools aim to put together a class of accomplished, interesting, and unique individuals. Admissions officers look to your personal statement to help accomplish that goal. If your personal statement doesn’t reveal something new or deeper about you, it becomes difficult to see exactly what value you’ll add to the makeup of next year’s incoming class (other than being a good student or accomplished test taker, which does nothing to set you apart from all the other incoming good students and test takers). Show admissions officers that you are an individual who will have a positive impact on the law school community. Describe a significant challenge you’ve faced. How did you handle it? What did you learn? Highlight a personal hardship you’ve overcome. How has it shaped you? How has it impacted your plans for the future? Discuss a defining personal value or characteristic. How did you develop it? Why is it important in your life? What is your most significant accomplishment? Why? Often, in answering these prompts, your essay will naturally also address why you have now decided to attend law school—and that’s great if it fits logically with the story you are telling. However, remember that it is not strictly necessary to write a “I want to go to law school because…” essay. Indeed, if such an essay fails to cover what’s most important—the personal side of the essay—then it won’t be successful. When brainstorming and drafting a topic that showcases how your unique nature or quirky background will enrich the experience of the students around you, here are a few final guiding tips. Seek feedback from others on your potential topics before investing too heavily in one. Identify what makes you you; what about your background is unusual or interesting enough to stand out from everyone else? Address the exact question being asked (if the prompt is not completely open-ended). Show, don’t tell. Engage your reader with clear, descriptive language demonstrating your main points in a memorable way. Proofread before submitting. Then have someone else proofread. Then proofread again. Hook your reader with your introductory paragraph. Select a topic or write a personal statement based on what you think the admissions committee wants to hear. You need to be yourself. Provide an essay-based summary of your resumé. You should be introducing new, interesting material in your statement. Discuss academic inconsistencies or other issues better reserved for an addendum. Try to accomplish too much in your statement. You don’t have to highlight how you are going to save the world or discuss a single experience that encapsulates your entire existence. Choose a topic that might offend certain readers. Give yourself permission to be a good storyteller in your personal statement and tell a story that makes the reader feel they know you. More importantly, when writing your law school personal statement, make the reader want to know you better!